Most American families use pediatricians—rather than generalist family doctors—as their frontline children’s health care provider. With the backing of its trade organization, the American Academy of Pediatrics (AAP), the field of pediatrics has been booming for some years, ensuring current and future demand for the many doctors-in-training who are choosing pediatrics as their specialty. Pediatricians’ average annual salary (roughly $200,000) may not be competitive with some of the more specialized medical domains, but pediatrics appears to offer high career satisfaction and inducements such as flexibility and part-time work opportunities. In addition, the 11 well-child visits recommended by the AAP over a child’s first 30 months (with annual visits thereafter through age 21) ensure a steady stream of repeat customers and revenue for pediatricians. In accordance with the Centers for Disease Control and Prevention’s (CDC’s) vaccine schedule, pediatric practices are expected to administer vaccines (often as many as six at a time) at about half of well-child visits through the adolescent years, making vaccination a foundational bread-and-butter component of pediatricians’ job description. The one problem with this rosy pediatric picture is that some parents do not want to go passively along for the ride. Rather than recognize the validity of parents’ safety concerns or admit to their own ambivalence about some of the newer vaccines, many pediatricians—nearly two in five according to some estimates—choose to boot uncooperative families out of their practice. It is quite common for pediatricians (and family doctors) to encounter parents who refuse one or more infant vaccines, most often due to safety concerns. 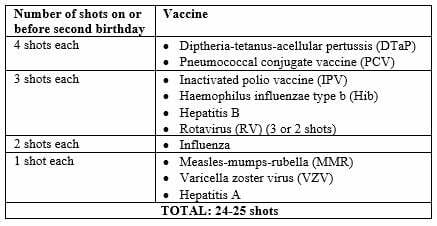 These concerns also mean that pediatricians frequently get requests to modify or delay the vaccine schedule—nearly three-fifths (58%) of pediatricians reported such requests in a 2014 AAP survey. One-size-fits-all vaccine proponents argue that families who question any aspect of the CDC party line are confronting pediatricians with an “alarmingly untenable dilemma” between either “continu[ing] to provide substandard care by foregoing many or most of the infant’s highly recommended protective vaccines” or “dismiss[ing] from the practice the family who refuses vaccines.” Rather than recognize the validity of parents’ safety concerns or admit to their own ambivalence about some of the newer vaccines, many pediatricians—nearly two in five according to some estimates—choose to boot uncooperative families out of their practice. A recent Medscape survey indicates that one of the main things that pediatricians dislike about their job is “dealing with difficult patients.” However, when pediatricians dismiss families whose only crime is the desire to make informed and individualized health care decisions on behalf of their children, the doctors are doing more than just unprofessionally dumping “difficult” patients—they also are protecting their bottom line. Increasingly, insurers and provider organizations are collaborating in a “value-based” approach whereby insurers give bonus payments to doctors and other providers who achieve specified quality of care targets. A widely reported example of this type of pay-for-performance model is the Blue Cross Blue Shield of Michigan “Performance Recognition Program,” which uses “meaningful” payments to reward Blue Care Network (BCN) health maintenance organization (HMO) providers “who encourage their patients to get preventive screenings and procedures.” For vaccination, providers receive $400 for each eligible two-year-old who has received all 24-25 vaccines shown below, but only if the provider manages to administer each and every shot to at least 63% of his or her patients. Thus, there is a formidable incentive not to let any patients slip through the cracks. For some vaccines especially, such as the preadolescent vaccine for human papillomavirus (HPV), researchers have attributed “suboptimal” vaccination rates to “inadequate physician adherence to guidelines.” However, because insurer-provider contracts rely on extensive reporting and sharing of medical and clinical information (including immunization data), participating physicians increasingly may be subjected to a unique form of social comparison. As insurers and practices publish data openly showing “how the care…each [physician] give[s] to kids compares with the care given by their peers,” no one will want to be the pediatrician who stands out. The AAP has long recommended repeatedly measuring practice-wide vaccination rates as a strategy to improve pediatricians’ “effectiveness” in garnering vaccine acceptance. Researchers who ponder policy responses to the problem of “vaccine refusal” argue that insurance payment incentives aimed at health care providers are a legitimate and valuable policy tool in this regard. Ultimately, these subtle and not-so-subtle financial incentives and social pressures are likely to maintain widespread adherence by pediatricians to the vaccine schedule—even in instances where contraindications are present. Although pediatricians have a legal duty to fully inform patients about vaccine risks and side effects, the lure of monetary perks and the desire to fit in may lessen their motivation to do so.